AGM to be held on Wednesday 11th July 2018 at 7:30 pm at Llandovery Station Cafe. NRW have closed the Trail in Crychan at posts 179, 113 and 115 due to felling. 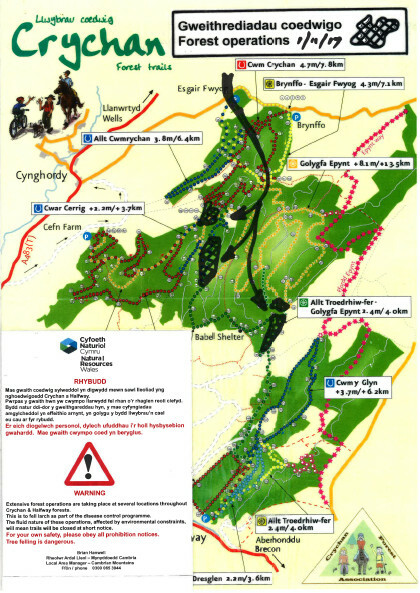 This effects Horse Riding Trail 8 Cwar Cerrig the extension the Cwm Dulais trail from Cefn Farm. There are a large amount of windblown trees at the top of Halfway (near waymarker 144) blocking the trail. Just what we needed after Decembers storms! NRW harvesting teams are currently working on the site so the trail will be closed for a couple of weeks. All the trails in Halfway Forest and the 2 small trails near Cefn Farm car park have been cleared of fallen trees and branches. Natural Resources Wales are working to open up the rest of Crychan. It may take a while as some of the trails have taken quite a bit of damage. Natural Resources Wales have put out a notice about significant tree damage from the recent heavy snow causing major disruption to tracks in Crychan and Halfway Forests. Read / view the NRW Notice. The Crychan Forest Association complete a track clearing session on the Cwm Dulas trail and around Pont Cefn Blewog. 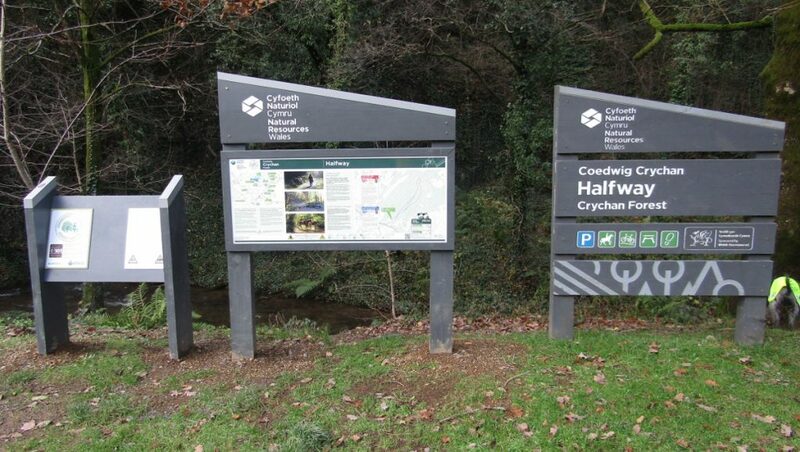 12 pictures have added to the Allt Cwncrychan Horse Riding Trail. This Trail makes an ideal 90 minute walk from Esgair Fwyog car park. With a stream and superb views.